As a headshot photographer in San Francisco I enjoy helping people put their best face forward. Headshot photography is often the first thing a potential employer sees. You can make sure yours are up to date with a professional portrait session. I met up with this beautiful lady at Presidio by Lucas Arts for her session. I've photographed the Katzenmeyer family for several years now so it was a treat to celebrate Mama with fresh headshots! We chose a variety of different poses to showcase her fun personality and presence. 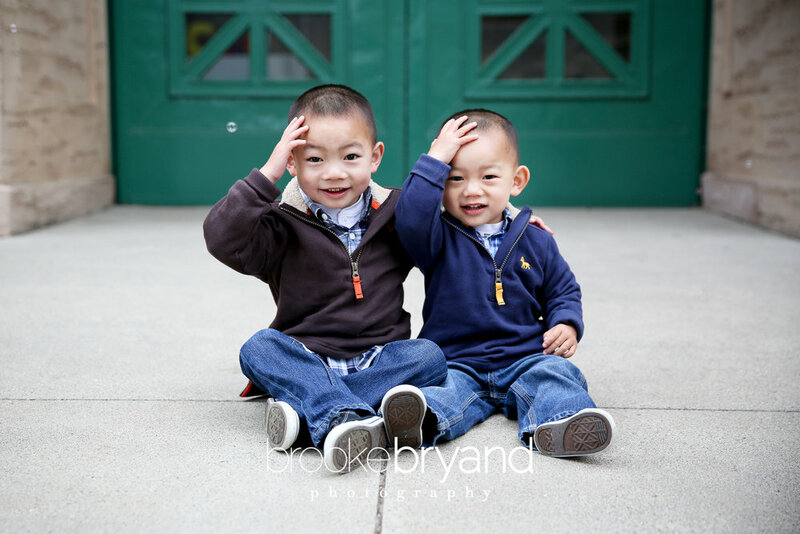 I also included a few images from my recent family session with the K family. This crew is always a joy to photograph and I enjoyed every minute of my time with them. I liked how well their wardrobe choices coordinated and those two kiddos...how adorable are they?! Whether you're looking to update your professional or personal photographs, I can help. Contact me today! This family just makes you SMILE! Little Oliver was just a ball'o'fun as we went on an adventure around Lake Temescal together. Graham is in high school and you'd think he was already in college for all of his maturity. He (and the entire family) was a delight to photograph - enjoy! There are so many aspects families have to consider when they do a family photo session. The clothing...the location...the weather...getting the kiddos to be happy at that exact hour...did I mention the clothing? And...to be honest...this major duty often falls on the mama. 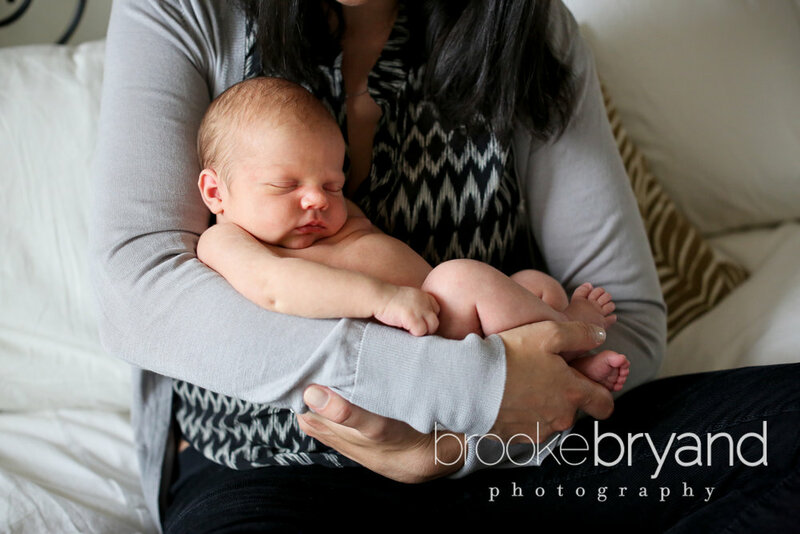 Moms hire me for 95% of the sessions I photograph. Jackie was no exception and I admired how prepared and, in many ways, relaxed she was for our session. We started at the studio to recreate a classic, adorable studio photo another photographer had captured for her first child. Her son nailed it and we were on our way to the Presidio Spire to do the rest of the session! She had plenty of outfits to choose from and - thank goodness - because her eldest son took a dive in the dirt within approximately 30 seconds of starting our session! Second outfit to the rescue. Here is the studio shot we created first, followed by our photo session near the Presidio Spire. Welcome, Ronan!!! He was a dream to meet and I adored his sweet parents (and grandfather visiting from SWEDEN). We captured not one but TWO smiles during our time together - so special! And I was a little obsessed with his tiny fingers - ha ha! The number of shoots I've done with Campbell and Lauren are almost too many to count. ALMOST! Campbell was about 1 when we first began and she is now 6!! Our first session ended in tears for Campbell (turns out she was crazy-sick that day but we didn't know! ), the make-up session was full of rain, and we wondered if we were cursed as a team. But we persevered and yahoo because this family adds joy and fun to each shoot - I look forward to each and every one! We were at the Presidio Spire by Andy Goldsworthy for our latest session and the girls did not disappoint. I mean...look at them in this first shot! Are you kidding me?? There is something special about sisters. Maybe I am biased because I have a sister who is also my best friend and I dream that every sibling pair would be as fortunate as I was in landing the sister-of-a-lifetime. Lily and Abby are so cute together! Abby (the younger of the pair) of course just stares at Lily in awe and tries to emulate every thing that Lily does. What a treat to document their relationship! A few of my favorites from our session at Sutro Baths in Land's End one foggy day in October! Daddy Kevin & Mama Ayesha love photography. Lots of people enjoy photography, but you know that you can win my heart in a millisecond when you have printed pieces hanging in your home and they have lots! I could immediately feel the warmth of their family by seeing their photos...their joy, their extended family, their life. Thank you for allowing me to contribute to the walls, Kevin and Ayesha! 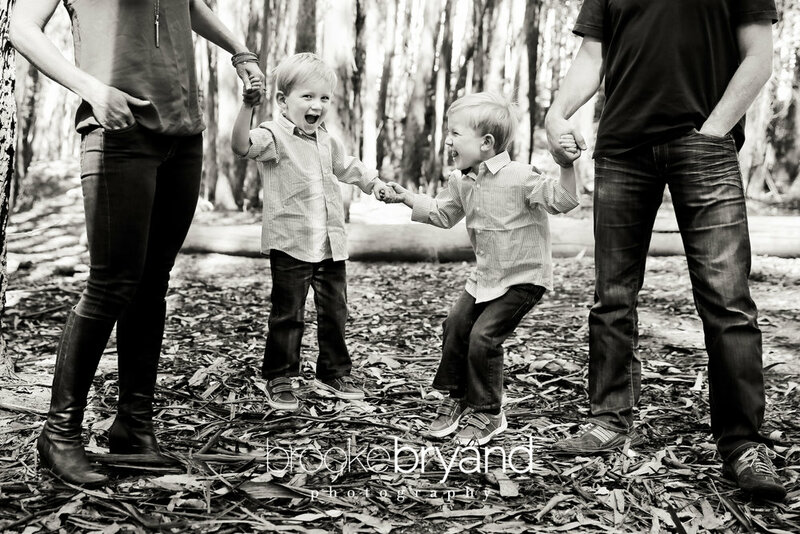 A few of my favorites from our session in the Presidio at their house and also at Lover's Lane. Sadie, Sadie, Sadie. You steal our hearts with your adorable antics, impress us with your aptitude and win our smiles with your silliness. Sadie has grown up on this blog with her newborn session, six months, one year, and now she will turn TWO in February! We got together in October over at Cavallo Point in Sausalito to enjoy the warmth relative to San Francisco at least! and celebrate this amazing family. Remember when the girls were 6 months? They were little bundles of love...and now they are walking bundles of fun! Big sister Jessica adores them...she is so sweet, patient and inclusive - it is a treat to watch the three of them together! Add in mom and dad and we have a beach full of VanderWalls! 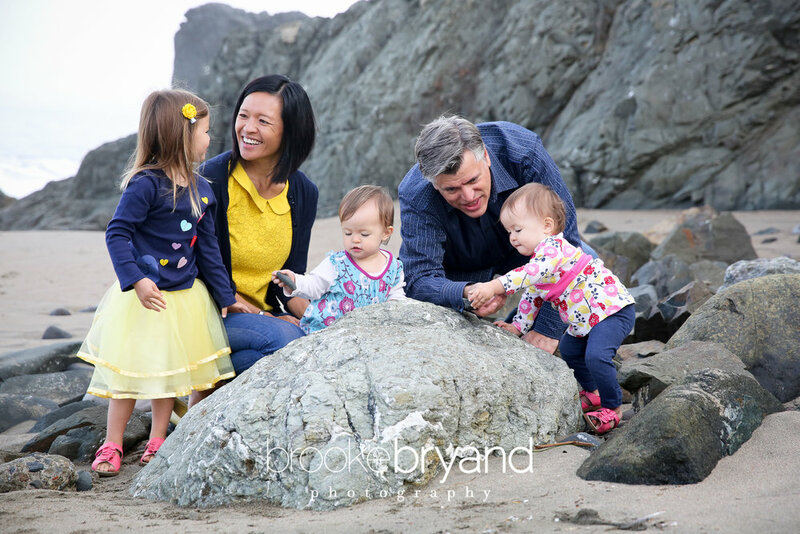 We took over China Beach and I am smitten with the images from their shoot. Enjoy! We started this as a headshot session for hot-shot real estate guru, Lisa Faulkner. She would never agree with this description, but she is the mayor of San Francisco. Walk anywhere with her and 10 people will stop to say hello. Not just the polite "hey-how-are-ya", but the actual stop what you're doing to check in. She is that kind of person. I met Lisa when our kiddos (my Cal and her Jackson) were younger...through our mom's group, through who-knows-what, through Lisa being Lisa. I asked her if I could take her headshot (as I stated in a previous post, I think it's my quest in life to create proper headshots for people! ), and then we decided that her kiddos Hannah and Jackson would come along...and then we figured hubby Jeff might as well join too! We had a brief session in the Presidio and I love the results!! Thank you for being you, Lisa. You are an inspiration. I was honored when Mama Tejal contacted me to be their first family photographer! Eva is 5 years old and was a delight. Her parents adore her from head to toe and we had a great time in Lover's Lane together. Photographing a growing family is not only a pleasure, but an honor. It means they chose me not once, but twice (or more!) to document the debut of their newborn into this world. I have photographed the Wilson Family since big brother Ben was about a week or so old. He now has a new brother named Nolan that looks just like him!! Ben has captured my heart over the years and this session was no different. Though our focus was on Nolan, I couldn't help but capture Ben in all his toddler-dom. Amy and Jeff grew up in San Francisco. As I drove to our 8:00am session, I could hardly see in front of my car due to the heavy fog that morning, but I was relieved to remember that Amy and Jeff grew up with this! Nothing shakes the natives (no pun intended), and sure enough - it didn't even phase them when I met them and their adorable boys for our session. We started at the Palace of Fine Arts and then explored the Presidio for some fun in the woods where we could let the "boys be boys" (i.e. collect acorns and find sticks!). Mila and Anya...oh girls, you took my heart! It was an honor to photograph these girls for their first official photo session! They were champs and let us dress them, undress them (you know I can't resist baby rolls) and dress them again! Mom and Dad, you are doing an incredible job of juggling what seems like an impossible feat...my hat is off to you! Thanks to you, I am bald! Shaving it Off on August 21st! What is Lifestyle Commercial Photography?